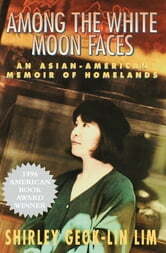 This “fascinating autobiography” from an award-winning Asian-American female author “reads like a novel” (The Washington Post Book World). With insight, candor, and grace, Shirley Geok-lin Lim recalls her path from her poverty-stricken childhood in war-torn Malaysia to her new and exciting yet uncertain womanhood in America. Grappling to secure a place for herself in the United States, she is often caught between the stifling traditions of the old world and the harsh challenges of the new. But throughout her journey, she is sustained by her “warrior” spirit, gradually overcoming her sense of alienation to find a new identity as an Asian American woman: professor, wife, mother, and, above all, an impassioned writer. In Among the White Moon Faces, Lim offers a memorable rendering of immigrant women’s experience and a reflection upon the homelands we leave behind, the homelands we discover, and the homelands we hold within ourselves.